Access control is more than just letting the right people in; it’s making sure that everyone is gone at the end of the day, and that no materials or assets leave with them if not approved. Safety Net Security can protect your business and ensure due diligence with your human assets by providing security officers to control entry and exit, including gate security. Our experts will recommend the most effective use and best placement for all your gates and fencing, intercoms, turnstiles and other infrastructure. 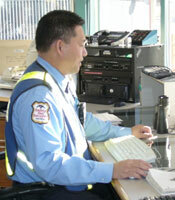 We will provide you safe and secure access control security. Our mobile patrols protect your perimeters if they cannot be fenced. Safety Net Security also provides expert advice and security services for marine operations.